As the official NAHB membership sponsor, Signature Kitchen Suite is offering an all-inclusive trip to Napa Valley to each of the top six Builder members who sign up the most new* members during the fall membership drive. * Membership renewals will not be included. Park space is shown in the Seiter Farms addition in Moore. Metro-area homebuilders surpassed last year’s pace at midyear, but fear some speed bumps ahead because of skyrocketing lumber and labor costs. Builders started 2,473 houses by the end of June, 2.3 percent more than in the first half of 2017, according to The Builder Report by Dharma Inc. in Norman. Dharma tracks building permits in Oklahoma City, unincorporated Oklahoma County, Bethany, Blanchard, Choctaw, Edmond, Midwest City, Moore, Mustang, Newcastle, Noble, Norman, Shawnee and Yukon. “Builders biggest concern is the out-of-control material costs,” said Tony Foust, owner of Da Vinci Homes in Norman and president of Central Oklahoma Home Builders Association. “We have seen in some cases a 40 percent increase from January to June, and it shows no signs of stopping. “It has stemmed from the lumber tariffs with Canada and our government not allowing us to harvest our own resources. The other concern is the increased labor cost due to the shortage of labor and skilled labor. Buyer interest has been strong so far this year and could spike further to get ahead of possible steeper increases in house prices, said Ali Farzaneh, co-owner of Home Creations in Moore. Farzaneh said Home Creations has more than 200 custom homes under contract with deliveries as far out as early 2019. With prices fixed, he said the increase in tariffs and material costs could drive construction costs higher than sales prices, which would have them selling at a loss. Buyers are paying attention to finance and international trade, he said. “Buyers are starting to understand the impact tariffs and a rising interest rate have on the price of homes, and as a result, their mortgage payments. Most buyers are trying to purchase their new home before the next wave of price increases,” Farzaneh said. Oklahoma City’s Homes by Taber is having its best year ever, and is on pace to surpass its 2018 goal of 340 sales, said Lindsay Haltom, director of marketing. “We are consistently reminding shoppers that interest rates and construction costs are on the rise,” Haltom said. “What does that mean for them? It means that what they are able to afford now, will not be the same home they can afford later. Our construction costs have increased by the thousands and luckily, we have been able to sustain our price points with minimal increases. Interest rates won’t stay low forever, either, she said. “If it’s not on their mind already, we want to make sure we are educating them about this key issue. While a small shift in interest rates can seem nominal, when someone is shopping based on monthly payments, this can greatly influence their ability to purchase,” Haltom said. Ideal Homes of Norman was two months ahead of 2018 projected sales at midyear, and expects buyer enthusiasm to stay strong throughout 2018, said Steve Shoemaker, vice president of sales and marketing. Buyers are “informed about their buying power,” he said. “There are so many tools online for buyers to learn about how interest rates will impact their mortgage payment. The headline may seem a bit ironic, if you are thinking about the passage of SQ 788, the medical marijuana bill. But it actually refers to the number of pro-business candidates that we supported who won or are in the primary. The biggest disappointment was Lt. Governor Todd Lamb not making the runoff for Governor. Our history with Lamb when he was a state senator was our biggest reason for supporting him. His pro-business reputation and his authorship of one of our most important pieces of legislation deserved our support. But our disappointment is balanced by the fact that both Mick Cornett and Kevin Stitt appear to be two pro-business candidates. I recently read a story in Oklahoma Watch that said, “The biggest prize will be the 23.9 percent of GOP primary voters who cast ballots for Lt. Gov. Todd Lamb, the one-time favorite in the race who was eliminated after he came a few thousand votes shy of cracking the top two. A June 6-7 poll by Right Strategy Group found that more than half of Lamb supporters identified themselves as “very conservative”. This could favor Stitt because about 47 percent of his supporters said they were “very conservative” while just 30 percent of Cornett’s backers identified similarly. August 28 will give us the answer. We backed Matt Pinnell for Lt. Governor and he advanced to the runoff where he will face Corporation Commissioner Dana Murphy. We backed Mike Hunter for Attorney General and he advanced to the runoff where he will face Gentner Drummond. This was a very bitter primary and many wonder if it will be just as bitter during the runoff election. We backed all the incumbents for Congress and they all won their primaries without a hitch. In the open seat for the 1st Congressional District we backed businessman Kevin Hern who advanced to the runoff. In the vast majority of House and Senate races for the Oklahoma Legislature, we fared very well. We were involved in 5 Senate races and won 4. We were involved in 14 House races in which those we supported won 10, made the runoff in 2 and lost 2. So once again, thank you to those who helped by voting and especially to those who supported our PAC. And remember, if you donate to Build-PAC by July 15, you are also helping our state PAC in time to make an impact in the general election. Send me an email and I will give you the details on how to help your industry. Garret Morgan (center) is training as an ironworker near Seattle and already has a job that pays him $50,000 a year. 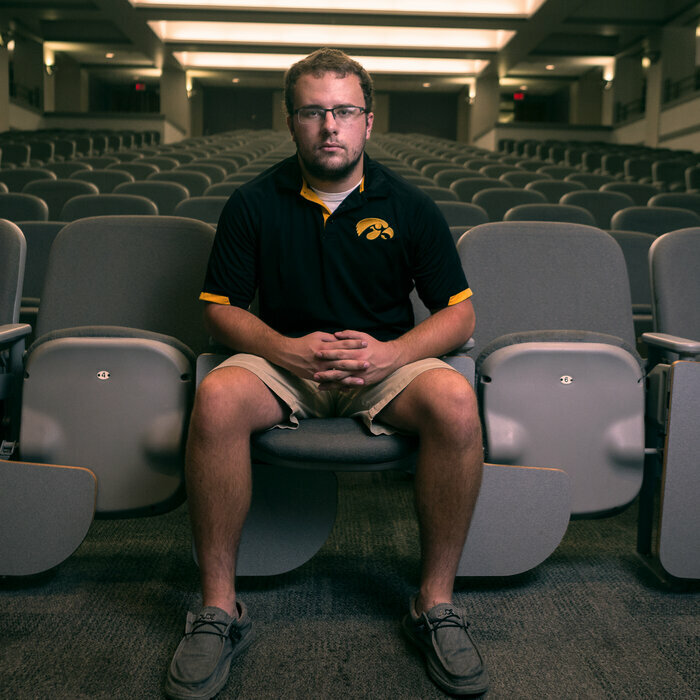 Like most other American high school students, Garret Morgan had it drummed into him constantly: Go to college. Get a bachelor's degree. "All through my life it was, 'if you don't go to college you're going to end up on the streets,' " Morgan said. "Everybody's so gung-ho about going to college." Are you heading to a program to prepare for a job? Are you going for an associates degree in your field? Maybe you're foregoing a degree entirely. We want to hear about your choice (or your students' choices). Morgan and several other men and women are dressed in work boots, hard hats and Carhartt's, clipped to safety harnesses with heavy wrenches hanging from their belts. They're being timed as they wrestle 600-pound I-beams into place. Seattle is a forest of construction cranes, and employers are clamoring for skilled ironworkers. Morgan, who is 20, is already working on a job site when he isn't at the Pacific Northwest Ironworkers shop. He gets benefits, including a pension, from employers at the job sites where he is training. And he is earning $28.36 an hour, or more than $50,000 a year, which is almost certain to steadily increase. As for his friends from high school, "they're still in college," he said with a wry grin. "Someday maybe they'll make as much as me." Some 30 million jobs in the United States that pay an average of $55,000 per year don't require bachelor's degrees. While a shortage of workers is pushing wages higher in the skilled trades, the financial return from a bachelor's degree is softening, even as the price — and the average debt into which it plunges students — keeps going up. But high school graduates have been so effectively encouraged to get a bachelor's that high-paid jobs requiring shorter and less expensive training are going unfilled. This affects those students and also poses a real threat to the economy. 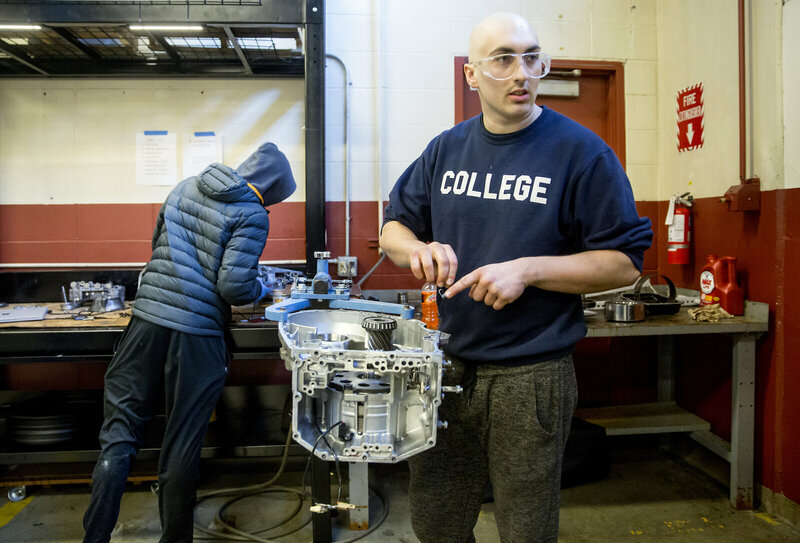 "Parents want success for their kids," said Mike Clifton, who teaches machining at the Lake Washington Institute of Technology, about 20 miles from Seattle. "They get stuck on [four-year bachelor's degrees], and they're not seeing the shortage there is in tradespeople until they hire a plumber and have to write a check." 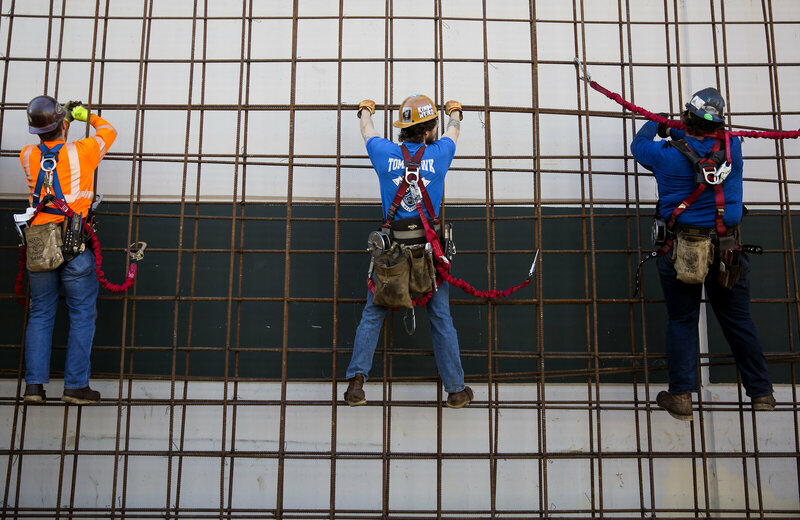 Ironworkers practice tying rebar at the Iron Workers Local Union #86 Administrative Offices in Tukwila, Wash. 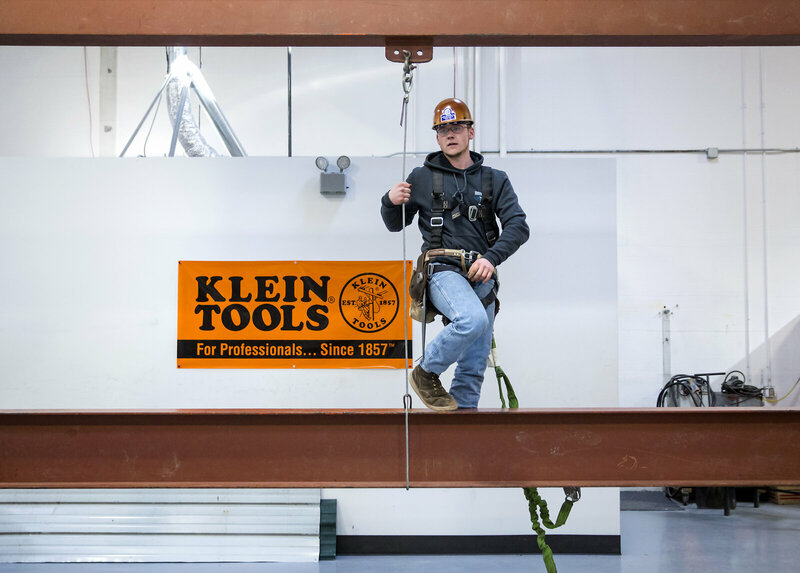 In a new report, the Washington State Auditor found that good jobs in the skilled trades are going begging because students are being almost universally steered to bachelor's degrees. Among other things, the Washington auditor recommended that career guidance — including choices that require less than four years in college — start as early as the seventh grade. "There is an emphasis on the four-year university track" in high schools, said Chris Cortines, who co-authored the report. Yet, nationwide, three out of 10 high school grads who go to four-year public universities haven't earned degrees within six years, according to the National Student Clearinghouse. At four-year private colleges, that number is more than 1 in 5. "Being more aware of other types of options may be exactly what they need," Cortines said. In spite of a perception "that college is the sole path for everybody," he said, "when you look at the types of wages that apprenticeships and other career areas pay and the fact that you do not pay four years of tuition and you're paid while you learn, these other paths really need some additional consideration." And it's not just in Washington state. "Parents want success for their kids. They get stuck on [four-year bachelor's degrees], and they're not seeing the shortage there is in tradespeople until they hire a plumber and have to write a check. 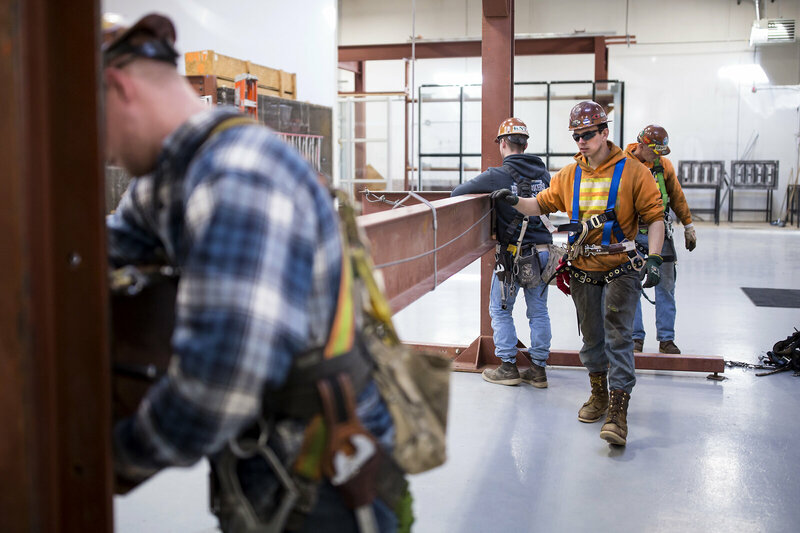 Seventy-percent of construction companies nationwide are having trouble finding qualified workers, according to the Associated General Contractors of America; in Washington, the proportion is 80 percent. There are already more trade jobs like carpentry, electrical, plumbing, sheet-metal work and pipe-fitting than Washingtonians to fill them, the state auditor reports. Many pay more than the state's average annual wage of $54,000. Construction, along with health care and personal care, will account for one-third of all new jobs through 2022, according to the Bureau of Labor Statistics. There will also be a need for new plumbers and new electricians. And, as politicians debate a massive overhaul of the nation's roads, bridges and airports, the U.S. Department of Education reports that there will be 68 percent more job openings in infrastructure-related fields in the next five years than there are people training to fill them. "The economy is definitely pushing this issue to the forefront," said Amy Morrison Goings, president of the Lake Washington Institute of Technology, which educates students in these fields. "There isn't a day that goes by that a business doesn't contact the college and ask the faculty who's ready to go to work." In all, some 30 million jobs in the United States that pay an average of $55,000 per year don't require bachelor's degrees, according to the Georgetown Center on Education and the Workforce. Yet the march to bachelor's degrees continues. And while people who get them are more likely to be employed and make more money than those who don't, that premium appears to be softening; their median earnings were lower in 2015, when adjusted for inflation, than in 2010. "There's that perception of the bachelor's degree being the American dream, the best bang for your buck," said Kate Blosveren Kreamer, deputy executive director of Advance CTE, an association of state officials who work in career and technical education. "The challenge is that in many cases it's become the fallback. People are going to college without a plan, without a career in mind, because the mindset in high school is just, 'Go to college.' "
Matthew Dickinson, 21, asks a classmate for help as they rebuild an automatic transmission in an auto repair technician program classes at the Lake Washington Institute of Technology. It's not that finding a job in the trades, or even manufacturing, means needing no education after high school. Most regulators and employers require certificates, certifications or associate degrees. But those cost less and take less time than earning a bachelor's degree. Tuition and fees for in-state students to attend a community or technical college in Washington State, for example, come to less than half the cost of a four-year public university, the state auditor points out, and less than a tenth of the price of attending a private four-year college. People with career and technical educations are also more likely to be employed than their counterparts with academic credentials, the U.S. Department of Education reports, and significantly more likely to be working in their fields of study. Young people don't seem to be getting that message. The proportion of high school students who earned three or more credits in occupational education — typically an indication that they're interested in careers in the skilled trades — has fallen from 1 in 4 in 1990 to 1 in 5 now, according to the U.S. Department of Education. Washington is not the only state devoting attention to this. California is spending $200 million to improve the delivery of career and technical education. Iowa community colleges and businesses are collaborating to increase the number of "work-related learning opportunities," including apprenticeships, job shadowing and internships. Tennessee has made its technical colleges free. So severe are looming shortages of workers in the skilled trades in Michigan that Gov. Rick Snyder in February announced a $100 million proposal he likens to the Marshall Plan that rebuilt Europe after World War II. At the federal level, there is bipartisan support for making Pell grants available for short-term job-training courses and not just university tuition. The Trump administration supports the idea. For all the promises to improve vocational education, however, a principal federal source of money for it, called Tech-Prep, hasn't been funded since 2011. A quarter of states last year reduced their own funding for postsecondary career and technical education, according to the National Association of State Directors of Career Technical Education. Money isn't the only issue, advocates for career and technical education say. An even bigger challenge is convincing parents that it leads to good jobs. Darren Redford, 20, looks to his instructor after completing a connector mockup drill at the Iron Workers Local Union #86 Administrative Offices in Tukwila, Wash.
"They remember 'voc-ed' from when they were in high school, which is not necessarily what they aspire to for their own kids," Kreamer said. 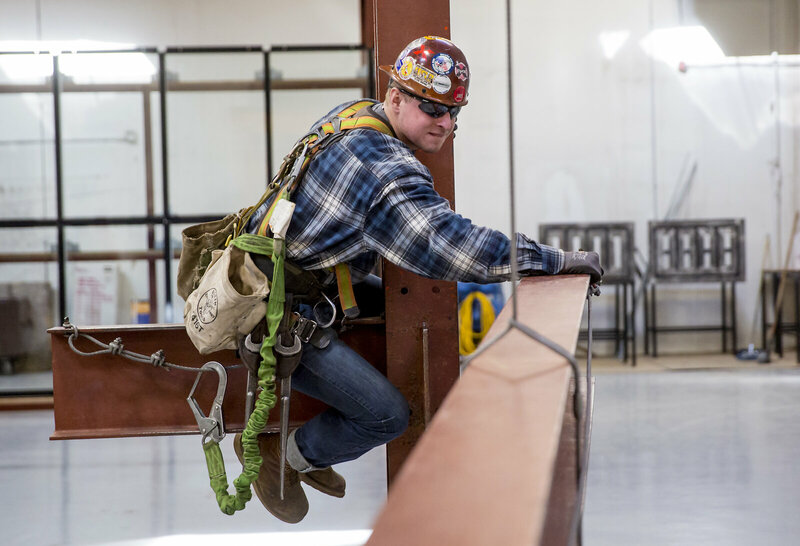 The parents "are definitely harder to convince because there is that stigma of the six-pack-totin' ironworker," said Greg Christiansen, who runs the ironworkers training program. Added Kairie Pierce, apprenticeship and college director for the Washington State Labor Council of the AFL-CIO: "It sort of has this connotation of being a dirty job. 'It's hard work — I want something better for my son or daughter.' "
Of the $200 million that California is spending on vocational education, $6 million is going into a campaign to improve the way people regard it. The Lake Washington Institute of Technology changed its name from Lake Washington Technical College, said Goings, its president, to avoid being stereotyped as a vocational school. These perceptions fuel the worry that, if students are urged as early as the seventh grade to consider the trades, then low-income, first-generation and ethnic and racial minority high school students will be channeled into blue-collar jobs while wealthier and white classmates are pushed by their parents to get bachelor's degrees. "When CTE was vocational education, part of the reason we had a real disinvestment from the system was because we were tracking low-income and minority kids into these pathways," Kreamer said. "There is this tension between, do you want to focus on the people who would get the most benefit from these programs, and — is that tracking?" 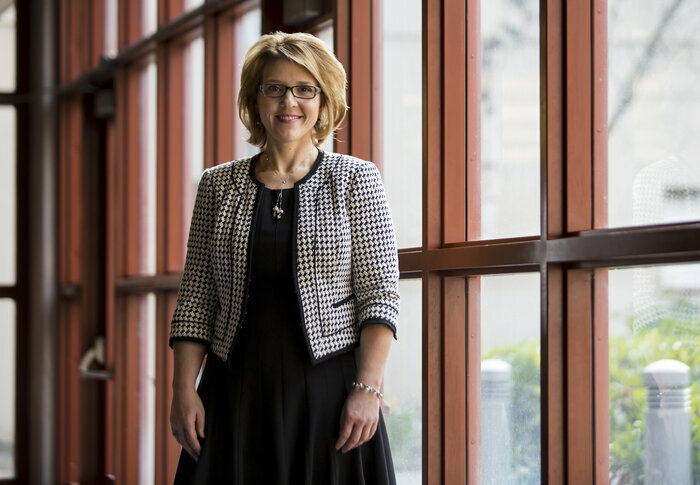 Amy Morrison Goings, president of the Lake Washington Institute of Technology, says, "There isn't a day that goes by that a business doesn't contact the college and ask the faculty who's ready to go to work." In a quest for prestige and rankings, and to bolster real-estate values, high schools also like to emphasize the number of their graduates who go on to four-year colleges and universities. Jessica Bruce followed that path, enrolling in community college after high school for one main reason: because she was recruited to play fast-pitch softball. "I was still trying to figure out what I wanted to do with my life," she said. Now, she's an apprentice ironworker, making $32.42 an hour, or more than $60,000 a year, while continuing her training. At 5-foot-2, "I can run with the big boys," she said, laughing. As for whether anyone looks down on her for not having a bachelor's degree, Bruce doesn't particularly care. "The misconception," she said, "is that we don't make as much money." And then she laughed again. Taylor Fawcett, 23, moves a column during a connector mockup drill at the Iron Workers Local Union #86 Administrative Offices in Tukwila, Wash.
Ken Saltink is the NAHB Remodeler of the Month for May. Long before he chose a career path, Ken Saltink, CGR, CAPS, owner of All American Remodel in Tulsa, Okla, started woodworking as merely a hobby to save some money on furniture. “I saw an entertainment center for sale and I thought to myself, I could build that,” Saltink recalls. So he purchased an old Craftsman table saw and got to work. He also began building other small items, and before he knew it, he was hooked. That hobby developed into a true passion for building, which propelled him into what has become a successful remodeling career — for which, Saltink has earned the honor of becoming May’s NAHB Remodeler of the Month. Saltink says keeping his company small has yielded positive results over the years. It’s given him the ability to keep his expenses low, and it’s allowed him the freedom to choose which jobs he wants to take — ensuring both the project and client are a good fit. And being on the jobsite as much as possible throughout the project enables him to respond promptly to any questions the home owners might have. 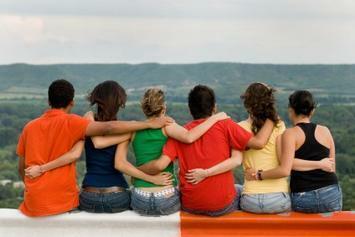 That strategy has helped reinforce quality customer service and create a continual stream of word-of-mouth referrals. He also says being a part of the HBA of Greater Tulsa Remodelers Council has helped his business grow, too. However, he admits that before joining the council more than 30 years ago, he was skeptical about the value of membership. Read the full Q&A in Qualified Remodeler magazine for more details on how Saltink keeps his company size small to pick the jobs he wants. Know a professional remodeler who takes remodeling to the next level? Nominate him or her for NAHB Remodeler of the Month. Don't get caught short underestimating the still evolving wave of demand for single-family homes and communities. Can two statements that contradict each other both be true? When it comes to Millennials, evidently paradox may be the rule, not the exception. For instance, age is just a number. So, if age is just a number, which would help explain how 35 might in fact be the new 25, then how can the other statement--that demographics is destiny--also be valid? Age, after all, is a building block of demographics, the science of people patterns. Remember, demographics technically refers to people and household patterns, and demographically-defined generational cohorts have to do with birth-rate cycles, which tend to encompass subsets of people who share values, attitudes, preferences, and behaviors we generally refer to as psychographics for segmentation purposes. At any rate, conventional wisdom has suggested that Millennials--a generational cohort most demographers would agree includes today's 21- to 37-year-old adults--have been one of housing's bigger unfurling mysteries of the past hundred years or so. That's because a perfect storm of a profound, life-altering Great Recession, heaps of college-related student debt, social norms around family formation, marriage and children, technology, and workplace transformation have been playing out simultaneously as this cohort has exited post-secondary studies, entered the workforce, and begun to behave as functioning adults in society. Seldom--in the times since "housing cycles" have come to be a thing--have such materially important variables with such significant potential impact on housing type preferences, means, aspirations, and intentions been up for grabs. What's interesting is that much of the focus on the latency of Millennial adults in lifestages having to do with pairing up, forming households, forming families, and creating two-parent households with children--the principle demographic engine of any economy--has been on the financial after-effects of the last decade's downturn and slow recovery. A post-traumatic, deeply indebted, urban-centric Renter Nation seemed to be on the verge of changing how housing, communities, and neighborhoods would work in America. Age was just a number. And, demographics was destiny. As Millennials crossed the 35-year-old threshold, they've seemed to double-down on more historically common housing preference choices and preferences. And the funny thing is, it's not all about finances, career trajectories, and economics in the wake of the Recession's destructive effects. 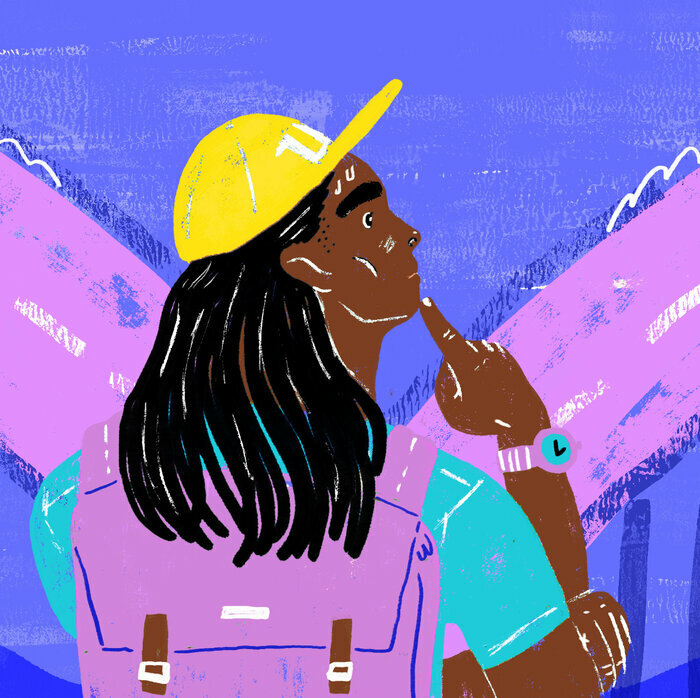 Here's a piece from New York Times contributor Roni Caryn Rabin that explores how many Millennials have chosen to wait to form couples and create families with almost entirely different motivations. Sociologists, psychologists and other experts who study relationships say that this practical no-nonsense attitude toward marriage has become more the norm as women have piled into the work force in recent decades. During that time, the median age of marriage has risen to 29.5 for men and 27.4 for women in 2017, up from 23 for men and 20.8 for women in 1970. They often say they would like to be married before starting a family, but some express ambivalence about having children. Most important, experts say, they want a strong foundation for marriage so they can get it right — and avoid divorce. “People are not postponing marriage because they care about marriage less, but because they care about marriage more,” said Benjamin Karney, a professor of social psychology at the University of California, Los Angeles. Now, this central insight on shared values--values about the marriage and family relationship--can be an important engagement point for residential builders and developers who seek attributive moments and points of traction with potential home buying customers. What's more, the demographics going forward are one exceptionally robust prospect for community and home developers who're able to crack the code of price, product, location, and customer care. "Over the last five years, 69% [of 35-44 year olds] have chosen single-family living versus just 25% for multi-family. Thus, a 35-44 year old is 2.7 times more likely to skew towards the single-family lifestyle. 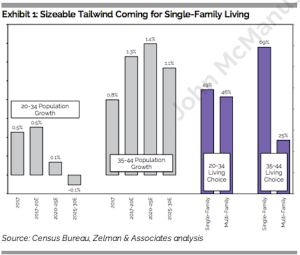 With outsized growth forecasted for this age cohort at the expense of weakening trends for younger peers, to us, it is clear that demand for single-family housing should outpace multi-family, even after considering any secular trends related to young adults forming families later in life. We do not believe that this is appreciated by the vast majority of housing market analysts and investors." Are you ready for the wait-and-hurry-up generation?